Lock in a great price for Mama Ruisa Boutique Hotel – rated 9.4 by recent guests! The staff at Mama Rusia were incredibly hospitable from the moment I arrived. Valeria and Remy provided great recommendations for the neighborhood, made reservations when I needed them, and made sure I was comfortable throughout my short stay. The design of the space is also very beautiful. Everything! Very charming boutique hotel, helpful and welcoming staff. Excellent decor! Beautiful hotel, great location, good value, helpful and friendly staff, and excellent breakfast. In some ways the nicest hotel I have ever stayed in. A lovely view of the city. Most tastefully decorated rooms. Lots of common area to sit in. Delightful breakfasts on our balcony. Attentive and friendly staff. Great service from Jean Michel and the team. Nice location in Santa Teresa - walkable distance for any main points of interest. Nice view from the wild window. What a phenomenal little hotel! So much history to the property - and it perfectly fits the gorgeous Bohemian vibe of Santa Teresa. The staff were very helpful and sweet, the rooms are perfectly designed with no detail left untouched. Just charm everywhere you look. I would certainly stay again. Gorgeous hotel with a brilliant eye for detail, beautiful little veranda to have breakfast, perfect service by warm and highly professional staff. I will absolutely stay here again if I have the chance. 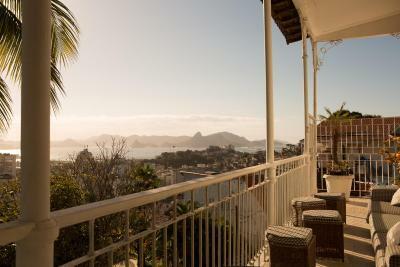 One of our top picks in Rio de Janeiro.Located in the quiet Santa Teresa district and overlooking the Guanabara Bay, the Mama Ruisa Boutique Hotel offers elegance and tranquility in a perfect setting for a romantic stay. The boutique hotel has seven air-conditioned rooms, all of them overlooking the bay and the Sugar Loaf. You can also admire the coast while savoring a rich breakfast on the terrace or having lunch by the outdoor pool. The attentive staff is another highlight of Mama Ruisa. As a guest of this hotel, you can also access the internet for free and get a massage at an additional cost. When would you like to stay at Mama Ruisa Boutique Hotel? Suite includes amenities as bathrobes and slipper. This air-conditioned apartment features a satellite TV, minibar and private bathroom. House Rules Mama Ruisa Boutique Hotel takes special requests – add in the next step! Mama Ruisa Boutique Hotel accepts these cards and reserves the right to temporarily hold an amount prior to arrival. Please note that this property can also offer, at a surcharge, a special gluten free breakfast and a kids menu. Guests can contact the property directly for more information. A lovely boutique hotel with stylish interiors and within walking distance of some great cafes. Staff were extra friendly and helpful and nothing was too much trouble! Would definitely recommend! The room service is overpriced. And maybe having a bottle of water for the welcoming could be better? Amazing view! The location was perfect to visit the famous stairs and it’s near to Lapa, which is the best place for us to enjoy the carnaval festival with locals. The staff is really helpful, they treat you as a host, I felt I was at home. Breakfast feels a touch expensive but the setting by the pool is undeniably lovely. Beautiful former house, which has been thoughtfully decorated and furnished. Spacious rooms and a real boutique hotel feel with service/staff to match (including guide book/general info). Staff were extremely friendly and always available to help (booking taxis / giving extra info etc etc). Would certainly recommend. Anazing house in the best location, wonderful host and staff. Outdoor is tooooooo hot so I recommend put fans around the pool. The house is even more beautiful than in the pictures. I loved the garden and pool, wonderful breakfast by the pool. A most relaxing holiday. Very helpful, patient and highly professional staff; their tips on sightseeing and restaurants were excellent. All the rooms have an unrivaled view of the neighborhood and town. It was a tranquil retreat from the city, with a tasteful atmosphere.